The inspiration for this scarf came from making a mitten cuff late at night and suddenly seeing it from a new perspective. Deep in texture and reminiscent of sea creatures, it’s almost impossible to stop playing with. This is a bold, bulky scarf that works well with conservative colors. I chose two neutral greys and one of the model's favorite colors for my Tentacular. This scarf would look equally wonderful with three tones of the same color. If you wish to make a more eclectic version, this could be a great way to use up asll the small amounts of worsted weight yarns leftover in your stash. Note: Gauge is not critical for this project. However, yarn used is knit more tightly than recommended ball band gauge to provide a firm fabric. There will be many ends to weave in. Try weaving in ends as you go, a few tubes at a time, using ends to close up the small holes that will result at the joining points. Each tube requires approx. 12-13yd/11-12m of yarn. To work a different color sequence, use the blank diagram provided to plan out color arrangement. All Rounds: [K1, p1] to end. Note: Tubes are cast on using 8mm needle, in order to keep edge loose. You may prefer to cast on over three double-point needles held together instead. All tubes are worked in the same way, except for the BO row. Using 8mm needle and A, CO 30 sts. Divide sts between double-point needles, placing 10 sts on each of three needles, and join to begin working in the round, being careful not to twist. Work 15 rounds 1x1 Rib. BO Row: Loosely BO 10 sts, leave remaining 20 sts on two needles. Using B, work as for first tube. BO Row: Loosely BO first 10 sts, join next 10 sts to 10 sts of first tube using three-needle bind off, leave remaining 10 sts on hold on needle. Using C, work as for first tube. BO Row: Loosely BO first 10 sts, join next 10 sts to remaining 10 sts of first tube using three-needle bind off, leave remaining 10 sts on hold on needle. Using A, work as for first tube. BO Row: Join next 10 sts to remaining 10 sts of third tube using three-needle bind off, leave remaining 20 sts on hold on two needles. BO Row: Loosely BO first 10 sts, use three-needle bind off join next 10 sts to 10 sts of fourth tube, along side closest to first tube; leave remaining 10 sts on hold on needle. BO Row: Loosely BO first 10 sts, join next 10 sts to remaining 10 sts of fifth tube using three-needle bind off, join next 10 sts to remaining 10 sts of first tube using three-needle bind off. First six tubes have formed a hexagon. BO Row: Join first 10 sts to remaining 10 sts of fourth tube using three-needle bind off, leave remaining 20 sts on two needles. Referring to diagram for sequence and color placement, continue knitting and attaching tubes until you have worked 90 tubes (15 hexagons). Bind off last 10 sts of final tube. 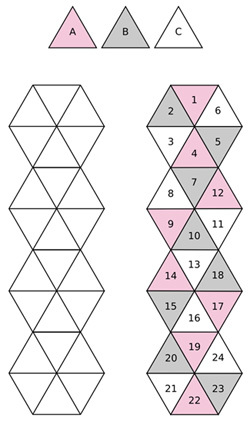 Note: For scarf shown, note that fourth hexagon has same color sequence as first hexagon; if using this color sequence, simply repeat the sequence of the first three hexagons five times. Weave in ends, using ends to close up small holes at joining points. Experiment with the final shape of the scarf, turning some tubes inside out, folding and rolling others. Pauline knits and lives in Northern Ontario. She’s learned to knit when she was 8 years old. She’s been knitting regularly for the last 13 years, but only obsessively for the last 6 years. She finds inspiration for knitted items from her kids. 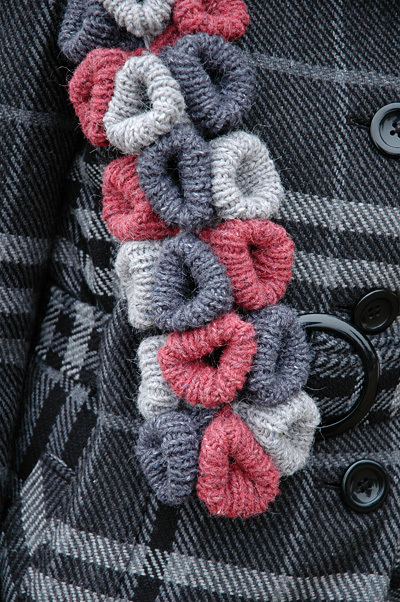 More of her inspirations can be found on her blog or on Ravelry where she’s known as Pog.